When first doing a layout our first though is based on vision. What does the eye see first? Sometimes this is a point of entry of the room or maybe a center of a doorway. If the room has a few doorways, the eye might travel to the longest wall. I would say that in the case of a bathroom, the eye would first go to the base of the shower or tub. Each room must be considered individually. Sometimes in layout there are many choices that will work. We need to pick the one we feel will “look” the best. Where do we start? In the case of tiling one room, take measurements in both directions. Compare these measurements to the tile and joint size chosen. This will indicate whether full tiles or cuts are necessary. If you end up with tiny cuts, less than 1/2 tile, at one wall, it will be more visually appealing if you shift the field so that larger fuller tile is used even if you have to cut at both ends. It is also necessary at this time to include in your measurements if any trim pieces are to be used. In the case of cove tile and the like, room for the tile must be added to your measurements and allowances made. In my experience, the best approach is to identify the longest wall and establish the first “working line.” Working lines are lines on the floor made with pencil, marker, or chalk line. These lines can and will possibly be moved several times during layout. If you are using chalk lines, do not spray the lines with clear lacquer until all of the lines are made. To establish the line, measure out from the longest wall at two places and make reference marks. If the room is large, over 6-8 feet, use a chalk line. If not, you can use a straight edge and pencil. Now you have your first working line properly spaced from the longest wall allowing room for a trowel pass between the line and wall. This first line is placed after you have established where the field of tile will start. We now need to check the room for square. This is accomplished by making a perpendicular line on an opposing wall at the exact spot the tile needs to be placed. Use the reference marks again to establish the line. Now you have a choice. A Large roofing square can be compared to the intersecting lines and an estimate of square can be made. A better method is the mathematical approach called the “3-4-5” method. The 3-4-5 method is derived from geometry, which calculates the dimensions of a triangle. In practice, a measurement is made down the longest wall line from the intersection of the two lines. A reference mark is made at 4 feet. Next measure down the other line and make a reference mark at 3 feet. Now measure the distance between the two reference marks. If the measurement is 5 feet, the walls are square. If they are not an adjustment will need to be made. Now it’s decision time. Will spacers be used or will the installation be “grid set?” There are advantages to both. Let’s talk about spacers first. Spacers can be used if the tile is nearly perfect in square and size when compared to each other. I can illustrate this thought by saying that if the room is large there will be many tiles involved. Lets say there are 30 6″x6″ tiles in the length of the room and 20 6″x6″ tiles in the width. Spacers are used and the tiles are not quite the same size. Let’s say they vary 1/32″ each. All that needs to be done is multiply 1/32″ 30 times and you get the picture. Those nice straight lines you started out with now looks like a snake. Spacers will work very well if the tiles are uniform and the room is relatively small. If spacers are used, only the original lines are necessary when the installation is started. After the installation is started, it is mandatory to occasionally check square by measurements using a straight edge or chalk line while the installation is in progress. This leads us to the grid set method. This method is preferred if the installations are large, multi-room, the tiles are irregular, or if special patterns are involved. The advantages to this method far outweigh the additional time involved in laying it out. It works like this. From the original lines established, grids are chalk lined onto the setting surface. The grids are marked on the entire surface in both directions from the original lines. This step forms boxes that the tile will be set in. What size are the boxes? This will depend on the tile size and the installer’s ability. The box must be large enough to accommodate the application of the bond coat by notched trowel while not too large to make setting difficult. The lines also must be established with perimeters that include the tile and grout joints. Look at the diagram and photographs of this method in use. This method is also preferred as it allows the installer to view the entire installation and cuts prior to one tile being set. Also, with this an installer can start anywhere in the project and the grout joints will line up. It is especially desired if there are any structures within the field of tile like that of islands or special designs. Let me illustrate this dialog by a suggestion. 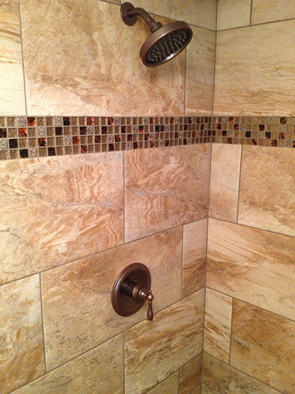 Let’s say that the tile chosen is 12″x12″ and the grout joint chosen is 3/16 inch. I would pick a grid or box measuring 24 3/8″ x 24 3/8″. This leaves a grout joint between the two tiles and at two ends. The tile would be set within the box or grid always orienting the tiles in the same two sides of the box wherever on the floor they are placed. For example, look at the floor and decide where you will orient the tiles within the grids. Then always repeat this orientation in each box within the installation.